Olentangy Orange’s Nik Brannon soars to the hoop with Olentangy Liberty’s Llwyatt Hofer (34) defending during the first half of Friday’s OCC showdown in Lewis Center. 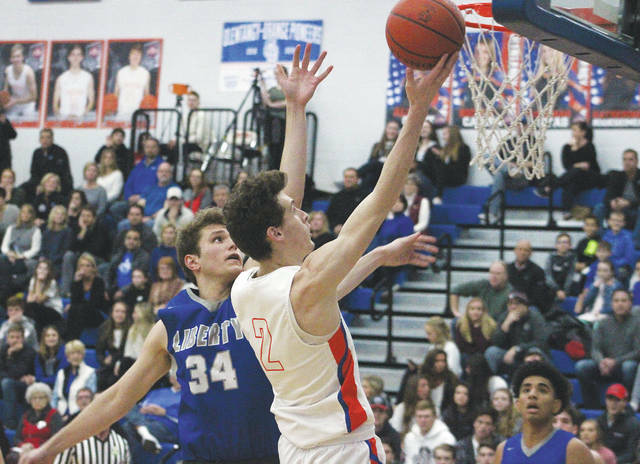 LEWIS CENTER – Nik Brannon scored 11 of his 15 points in the second half, including a go-ahead layup on a breakaway with 2:16 left that gave the Olentangy Orange boys basketball team the lead for good Friday night in Lewis Center. The Pioneers held rival Olentangy Liberty to just one free throw over the final 3 minutes, 14 seconds to secure a 51-47 victory, avenging a loss to the Patriots earlier in the season. Orange coach Anthony Calo used a phrase, “sound with life” over the days leading up to the game. Liberty’s Ben Roderick tied the game 46-46 with a steal and a score and rebounded a miss on Orange’s next possession. Then, Orange’s Ryan Cutler rebounded a miss and fed Andre Irvin, who threw a half-court pass to Brannon for a layup to break the 46-all tie. Nick Nakasian made one of two free throws, rebounding the miss. Brannon blocked a shot later in the possession, though, and Luke Ballinger rebounded misses on each of Liberty’s next two possessions. Ballinger made five of six free throws in the fourth quarter, including three in the final 26 seconds to help the Pioneers put it out of reach. It came down to two things for Liberty, according to coach Greg Nossaman. Irvin had 10 points and five assists, Bryson Lane and Ballinger scored eight points apiece for Orange. Cutler had eight rebounds, Ballinger added seven and Brannon five for the Pioneers (9-5, 4-2). The win moves Orange into second place in the OCC-Buckeye, a game behind Liberty with four games remaining in league play. The Patriots won the first meeting between the two in Powell. Orange went on an 8-0 run after Liberty scored the first two points of the game. Ballinger and Irvin each knocked down a 3 to highlight the rally. But Roderick and Nakasian led an 11-3 run to give the Patriots the lead again. The game largely remained a one- to two-possession game until the third quarter. Roderick scored all seven points to break a 29-29 tie, giving Liberty its largest lead. Brannon scored seven points in a 13-4 rally that bridged the final two quarters to help the Pioneers overcome a seven-point deficit – it’s largest of the game. Roderick finished with 24 points and six rebounds and Nakasian added 11 points, eight rebounds and three assists to lead the Patriots (11-3, 5-1), who had a six-game winning streak snapped. Both teams return to action Tuesday night against non-league opponents. Orange travels to Dublin Coffman and Liberty visits Hilliard Davidson. Both games are scheduled to start at 7:30 p.m.